Manns Harbor, NC: With even a glance at the new 61-foot three-stateroom/three-head JICHI, newly splashed in November 2017, it is evident that Paul Mann and his team surpass all expectations and limitations with this stunning design. This yacht combines unique style and one-of-a-kind looks with luxury deriving from rich hardwoods, superbly crafted details, and hints of South Beach interior design, and radiates the unique personality of her owner. Unquestionably, the JICHI commands attention at every turn. Despite the striking interiors, JICHI’s owner and the Paul Mann team never forgot throughout the build process that JICHI is first and foremost a world class sportfisher. Here is a yacht that is filled with today’s technology and components, the latest contemporary style, multitudes of comfort and, above all, the most up to date fishing techniques and functions, resembling a bullet in the ocean with outstanding and responsive performance. She is fully featured and equipped to fulfill a dream of extended sportfishing with visits to tournaments and destinations anywhere in the world. In fact, JICHI’s twin CAT C32 ACERTS deliver 3,850 HP to an incredible hull design for best-in-class performance. With a cruising speed of 40 knots, JICHI was proven from the first sea trial to be nimble and incredibly fast and efficient. She’s easily handled from the bridge or even the full custom tower. Chasing the birds and staying with the fish will be easy aboard this jewel. It is a great combination of incredible looks and top performance! This yacht combines unique style and one-of-a-kind looks with luxury deriving from rich hardwoods, superbly crafted details, and hints of South Beach interior design, and radiates the unique personality of her owner. JICHI is destined to be a world contender and a solid winner on the tournament circuit. The owner’s well-recognized and much awarded fishing skills and knowledge combined with Mann’s engineering and design expertise have created a “partnership” that is a true billfish magnet. 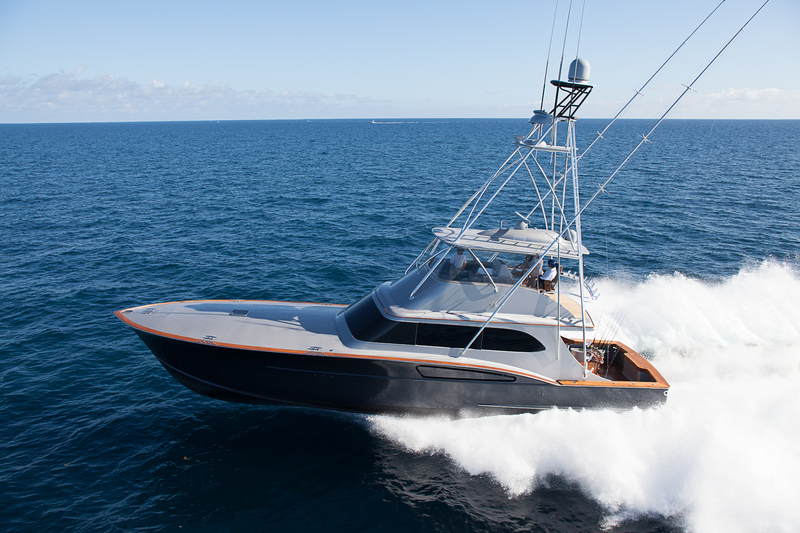 As if to prove it, less than 30 days after arriving in her home port of Miami, JICHI’s owner and crew has already enjoyed 20-plus billfish days. Without a doubt, here are many more to come! This fishing yacht is highly equipped with the latest electronics, cameras, mechanical components andequipment including an electric bow thruster, a high capacity ice machine, FCI automatic water maker, two 50-amp shore services, two Kohler 23Kw generators, a 275-gallon water tank, a 1681-gallon capacity fuel tank, plus a full custom tower with the latest teaser and kite reel capability. 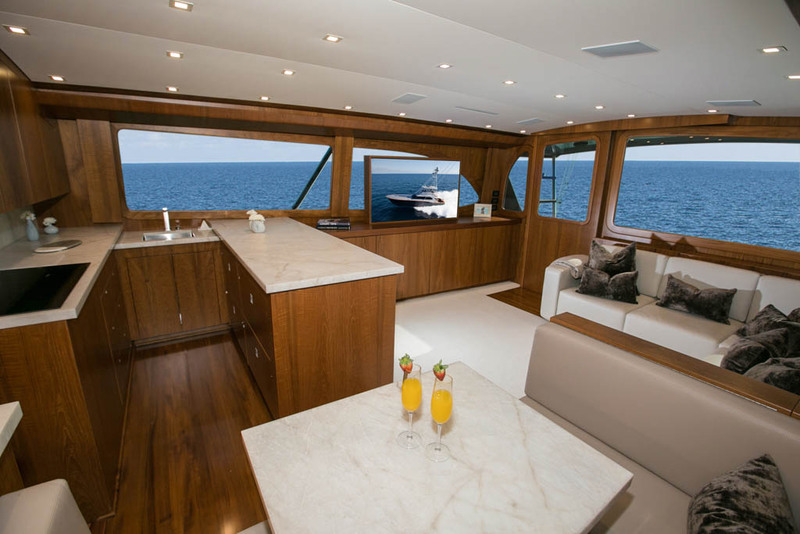 The custom mezzanine houses freezers and refrigeration also found on the flybridge. JICHI is ready to go fishing for extended periods anywhere in the world. Air conditioning is available throughout the boat including in the cockpit. Thirty years of experience, expertise, and craftsmanship are truly reflected in JICHI. Paul Mann is the most awarded woodworker in the custom sportfish niche. Paul creates interiors of an entirely new level, offering dazzling combinations of burnished wood, superb cabinetry, and lush fabrics. Mann’s multiple-award winning craftsmanship is recognized throughout the marine and woodworking industries. Custom teak joinery and the owner’s singular style are breathtaking throughout its interior. The 3/3 layout and salon are not only beautiful and stylish but designed for family retreats. Over its 30 years, the Paul Mann company has evolved from building functional, seakindly and great running boats for the North Carolina coast to becoming a true custom boatbuilding industry leader, creating magnificent fishing yachts that are home-away-from-home anywhere in the world. Every single build provides owners and their crews with superior performance. Owners, prospects, and enthusiasts are invited to find out more and visit Paul Mann Custom Boats in Manns Harbor, NC.